You know what the funny thing is? A short fantasy book like The Hobbit gets to split into a huge budget, draggy trilogy of 2-hour-plus movies, while a biography about the great man, who made unbelievable sacrifices to fight for his people and inspired leaders all around the globe, got just one single rushed film. It’s safe to say that Mandela: Long Walk to Freedom is unlike to get any Oscar nomination but fortunately, it’s far more watchable than the film about Aung San Suu Kyi and the recent one about Princess Diana (which I didn’t even bother to finish). 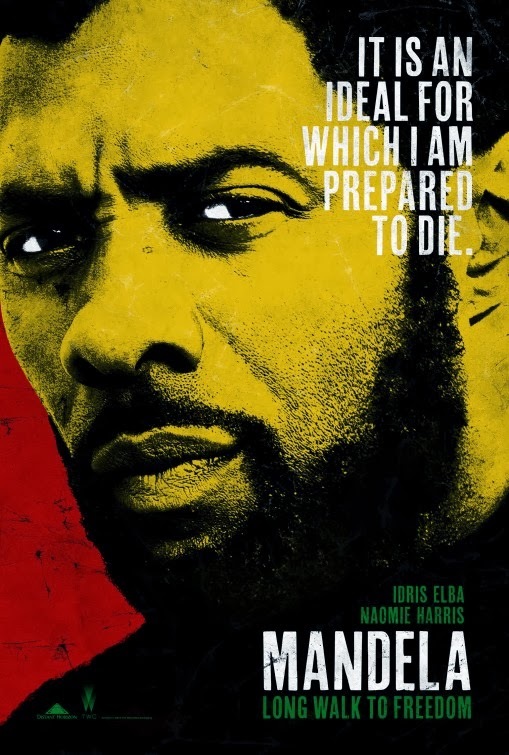 Idris Elba doesn’t look anything like Nelson Mandela to me, but his performance (and that convincing South African accent) powered the film along with Naomie Harris’ standout presence as Mandela’s former wife Winnie Madikizela-Mandela, who have also gone through struggles of her own during his 27 years of imprisonment. Without these two captivating performance, the film may have been a complete failure due to it’s lack of meticulous development over the years of Mandela’s revolutionary activities and events that gradually brought down apartheid and racism in South Africa. I felt almost completely emotionally unattached throughout the film and when the credits rolled, my immediate thought was that the impact was definitely missing. The film has failed to make me grasp the contributions he made, and to feel the hardship and struggles he went through. It’s like as though it was a breeze walk through the years for him. The producers, director, the screenplay writer, or all of them, seems to have taken his dangerous activities and life in prison too lightly. The story of Nelson Mandela cannot be forced and squeezed into just one movie, instead, it should be made into three instalments – part one: his younger life and his sabotage campaigns, part two: the 27 years of imprisonment, part three: his release, the election and his presidency. This is why the other films focused on one period of his life, or one topic, instead of the whole. Malaysian censorship: I didn’t watch it at the cinema but if there’s anything to cut, it’s only the makeout/foreplay sequences. Second opinion: Even my girlfriend felt that it wasn’t emotionally engaging enough, and agreed that it’s a bit rushed. Verdict: If you’re too lazy to even read up about the great late Nelson Mandela on Wikipedia, this fast-paced 2 hour plus depiction of the man is definitely for you. Synopsis: A chronicle of Nelson Mandela’s life journey from his childhood in a rural village through to his inauguration as the first democratically elected president of South Africa.